Deck building and miters saws are a perfect match up of a tool to a project. When I was approached about doing a 12” compound miter saw shoot out I could not think of better timing to coincide with some of the renovation work I have done lately. In particular, I am working on two side by side bungalow style homes build in the late 1920’s. One of the best features of these homes is the full width front and back porches. All four porches have seen better times and all four required complete demolition and rebuild. My new porch design did depart slightly from the original framing which consisted primarily of 2×6 members with tongue and grove porch flooring. To meet the current hurricane code standards that are required here in Florida I had to beef things up slightly by using 2×8 framing members and larger timbers for the columns and railing posts. Needless to say we had plenty of cutting to do and it was a great chance to try these seven saws out to see who made the best 12″ compound miter saws of the bunch. 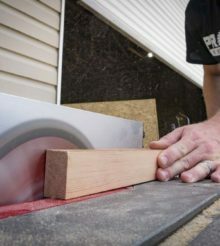 Some might be wondering that if you are going to spring for a new 12” compound miter saw, why not just get the slider style to maximize the cutting capacity? Good point, but as we will see, a sliding miter saw would have been overkill for several reasons. The first biggie in choosing to do this review is that we are interested in job site portability and storage. Lets face it, in most job site trailers space is a premium, and since the physical size of the regular 12” miter saw is smaller than their slider brothers, it makes sense. When it comes to having to carry a saw around, lighter is better which is always the case when comparing the regular to the slider. Another big consideration is the reality that for many trim and framing scenarios, you typically are not going to be working with material that is larger than 8” in its biggest dimension. Think 2×4’s, 2×6’s, 2×8’s, 5-1/2” speed base and 6” crown. For the miter saw purest, a fixed head (non-sliding) miter saw will always deliver more exact cut since there is less potential of side ways movement and mechanism wear. This is not to say that sliding miters saws are not useful, because we can make an argument to that end; for the sake of simplicity, portability, and price we will focus on 12” compound miter saws that have either single or dual bevel capabilities. Of the seven saws that we will look at, there are certain features that are common to all the saws and it is worth pointing them out as the minimum standard of what to look for when shopping. All the saws have 15-amp motors, electric motor brakes, top mounted carry handles, adjustable fences and dust collection bags. Each of the saws came with a carbide tipped blade that ranged from 30 to 60 teeth. For adjustments all the saws are able to offer both left and right miter cuts past 45 degrees and as a minimum, all were able to do left hand bevel cuts up to 45 degrees. Since we do not always have control over the products that come in and every manufacture does not offer both single and dual bevel capabilities, we had to review what was available. Some of the saws in this review are single bevel and some are dual. The last item of commonality is that all the saws provide for preset miter and bevel angles. They all have at least 9 positions of built-in miter stops with a dedent at 0 degrees and detents in both directions at 15, 22.5, 31.6, and 45 degrees. For bevel stops they have detents at 0 and 45 degrees. As the saws came in, we carefully opened each box and inspected the tools inside. When checking out a brand new saw, one of the first things we do is to verify the how true the blade is to the table and fence. We verified and actually had to adjust the squareness of two of the saws that came in. Neither was far off but since we wanted to do precision measurements of cut angles, we went ahead and adjusted the fence on these saws. While some guys might point this out as a negative on the manufacture or their product, we are going to let the out of square arrival of the saw go, given the abuse that packages experiences when going though the shipping channels. It really is a wonder that they arrive with any kind of accuracy. Any carpenter worth their salt should periodically verify and adjust their saw to meet their required level of accuracy anyways. To further even the playing field we removed the factory installed blades and replaced each with a brand new 12” Irwin Marples 40-Tooth General Purpose saw blade. These laser cut blades are made in Italy and feature thin kerf ATB (Alternate Top Bevel) ground carbide teeth. Since each saw now will be cutting with the same new blade, it makes it easier to test the performance of each saw. Testing seven saws is not something that happens all at once or in a very fast way. These are large size tools and it takes a while to get to know the features of each tool. Thankfully we had a reasonable amount of time to use the saws on multiple occasions in testing in the shop and out in the field on one of the four porches we have been working on. In testing, one of the first thing that comes to mind with a miter saw is how big a piece of wood will it cut. Given the blade size you would think that all the saws would have about the same cut capacity, but given the geometry of the blade axis, the fence and the swing arm design there is some room for differences. The best 12″ compound miter saws will slice through 2×8 lumber with no problem, but some models will exceed even that by a small margin. First we tried different size pieces of nominal sized lumber at a 90 degree cross-cut and it pretty much boiled down to a pass/fail on if the saw could handle it when it came to nominal sized material like 2×4, 4×4, 2×6, 2×8, and 1x material from 4 though 8 inches. Of course each saw was able to handle any of these materials. The capacities listed in the specifications chart are based on our test measurements for the widest and thickest pieces that could be cut laying flat on the table and sitting vertically against the fence. In our deck building, we largely used these saws for cutting the 2×8 framing members to length and trimming the 5/4”x6” deck boards. Since each saw had the same blade and essentially the same size 15-amp motor, we never experienced any instances where the motors bogged down or seemed stressed, even when cutting new, wet pressure treated wood. Miter angle cuts on all the saws were easy to adjust and lock In, even if it was not one of the preset detents. There is a range of methods to adjust and lock in the miters with most of the saws having a screw down type handle to lock in the miter angle. All the saws had at least 9 miter stops with the DeWalt being the one with more at 11. These preset angle stops make it a snap to quickly find common cut angles. All the saws allowed an override on the detents with the Milwaukee providing the most accurate way to measure miter angles thanks to its digital miter angle readout. All the saws were able to fully rotate the table in both left and right directions. The commonalities in the bevel cuts with these saws is where we discovered the largest differences. Since some of these saws in this review are single bevel and others are dual, there are some obvious differences there. All the saws have stops at 0 and 45-degree bevel angles and four of them also have a 33.9-degree detent setting for cutting crown. The saws without the crown cut setting at least have a mark for it on the bevel scale. If you are not a regular at cutting crown molding, it can be one of the most challenging cuts to make since they need a compound angle cut. Since all these saws allow for compound angle miter cuts you no longer have to use the traditional method of standing your crown trim boards upside down against the fence. You can easily set the miter and bevel and cut the crown trim laying face up, flat against the table. What we loved is that the Ridgid saw actually put a crown cutting guide permanently affixed to the table on their saw. I’ll admit every time I cut crown, since I only do it rarely, it takes a little thinking to still get it right even with the built-in angle stops. Adjusting the bevel angles varied greatly. The best 12″ compound miter saws have easy adjustment of bevel and miter. Most of the ones we tested have some sort of large rotating handle on the back of the saw that must be loosened before you can pivot the head. On these saws you must reach behind or the saw to adjust. The Hitachi has a unique micro adjustment that, once the main screw is loose, you can rotate the barrel to dial in an exact angle. With the Milwaukee and the Bosch, there are handles that can be search easily from the front of the saw that make adjusting the bevel angles very effortless. For most reading a comparison article, you are probably looking for a winner to be declared. My intentions in the beginning was to crown a winner but after spending time with each saw I realized that while some saws did have more features that I appreciated, I was not able to name a single miter saw that does everything. This is not one of those issues were we did not want to hurt feelings ether. Think about it, I looked at a budget minded SkilSaw and used it next to the most expensive Milwaukee. Sure there are differences but in the scope of the abilities of the saw to cut wood accurately and repeatedly, those differences became small. What I discovered more than anything is that your next miter saw purchase will probably come down to price and feature preference not saw performance. For the guy cutting crown trim on a regular basis, the Dewalt, Hitachi and Milwaukee are best suited because of their dual bevel capabilities. The Bosch, Makita and SkilSaw are by far the most portable since they weigh the least and have some of the smallest overall dimensions making them ideal for the contractor that need a mobile setup. I would go as far to speculate that no mater what saw you choose, you will probably not be disappointed if you make the purchase after doing your homework on the features that it has. Even though this is a single bevel model, the Bosch miter saw has a lot of nice features that make it an easy choice. The side mounted motor and gear-drive provide the second fastest speed of all the saws that we tested at just over 4300 RPM. What surprised us is that this saw is visually more compact than many that we looked at, yet it allowed some of the tallest cuts through material held against the fence. Bevel adjustments were among the easiest to make as well since it did not involve reaching behind the saw. There is an easy to manipulate lever mounted towards the back on the right side of the saw that you just pull towards you to release bevel pivot. We really liked the integrated table extensions that expand easily out of the base from both sides of the saw. The DeWalt came in as the quietest saw in the bunch and that can probably be attributed partly to its refined belt drive system. Since this is a belt drive, this saw has dual bevel abilities and offers five bevel detents and can tilt to 48 degrees in either direction. We liked the lack of a twist miter lock and really favor the speedy leaver lock and 11 miter stops (more than all the other saws in the lineup). We found the saw to be accurate out of the box and setup was easy. Probably our biggest gripe is that if you hold your thumb to the side of the handle, rather than down, you can expect the blade guard to swing up and potentially slice your thumb as you move the head of the saw towards your workpiece. The good news is that this will only happen once before you learn how DeWalt intended you to hold the handle. In the manual it explains that this is by design, (not the thumb slicing part) so that you can use your thumb to position the guard for certain cuts when you need to hold the guard out of the way. We liked that If you remove the main fence, there is smaller built in fence that when used in conjunction with a 1-1/2” thick sacrificial board, your cross cut capacity is bumped up to a 2×10. If you pick up this saw we suggest you spring for the DWX726 Stand as well. The Hitachi C12FDH comes with a belt drive motor that positions the motor above and behind the blade axis. What this does is makes for great site lines and extreme angles on right hand bevel cuts. To further, make bevel cuts easier, both sides of the two piece fence are on swing arms that quickly rotate the upper portions of the fence out of the way. This saw’s fence is 5-1/8” tall making it one of the top three tallest in the review. The tall fence is ideal for cutting tall materials like base board or crown. On the particular saw that we received for review, we did find slight play in the detent stops on the miter scale, of course once we located the miter angle in by turning the miter lock handle, this was not too much of an issue. The built-in laser has an on and off switch and we found that when making cuts out of direct sunlight, it was accurate and helpful. We did like that a material clamp was include but there were no table extensions. The Makita LS1221 comes in as the lightest saw in our round up and ironically it is also the saw with the least amount of plastic parts. Figure that one out. Don’t let the light weight fool you into thinking that this saw lacks features or power because neither is true. This saw has a gear reduced direct drive motor which makes it by default a single bevel saw. Every bit of the saw is either painted or has a nice machined finish. There was no unfinished or sharp edges hidden anywhere which makes the over all the build quality of this saw feeling like it is swiss watch. Unlike all the other saws in the review, the swing arm that activates the blade guard is almost completely hidden which makes for a tidy appearance as well. We really appreciate the dual table extensions that are easily removable, the material clamp and the fact that every user removable or adjustable item uses the same wrench which is included. The Makita also has the distinction of being the only saw that is assembled in the USA. If you must have an unconventional miter saw, the Milwaukee is for you. All other miter saws put the motor axis parallel with the blade except with this saw. The motor is mounted above and to the top of the blade at a perpendicular axis. 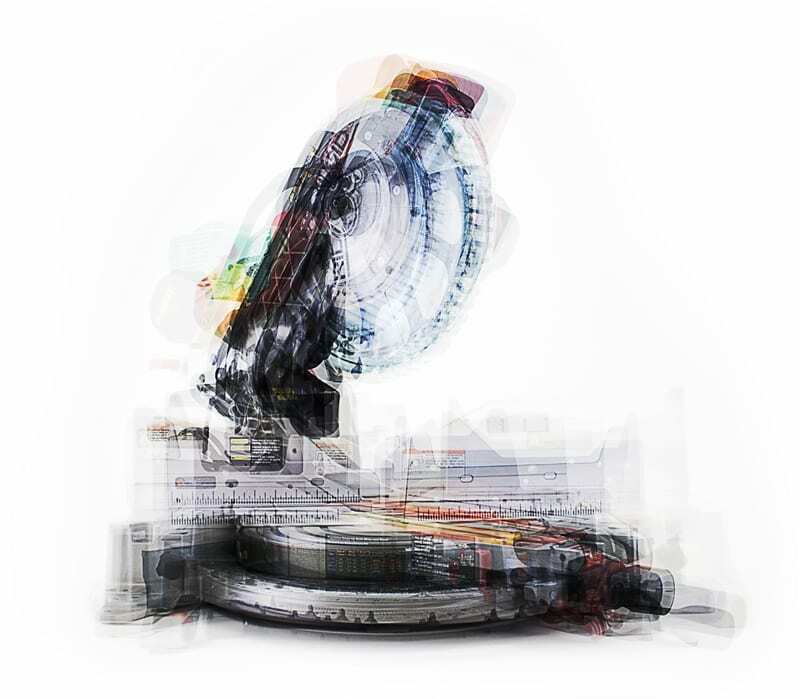 Think of the difference as similar to a worm drive verses a side winder circular saw. This setup makes it so that none of the start up torque is felt at the handle meaning that there is absolutely no blade jump. Just pull the trigger and the electronically controlled motor is spinning at is optimum RPM and you can’t really feel it. We really like the digital miter angle readout (a regular scale is also present) and the dual work lights that illuminate both sides of the blades. We found this saw to be the second heaviest and overall the most bulky to move around which would make it best suited to be mounted on a wheeled stand or left in the shop. The spring loaded bevel stop lever system can be a little tricky to get used to but it does offer seven internal bevel stops which is more than the rest of the saws in the review. All in all this saw is constructed like a tank, offers the steepest miter and bevel angles in both directions and has the highest fence out of the bunch. The Ridgid miter saw is full if small features that are not gimmicky but real world time savers. The miter lock knob is gone and in it is place is a flip lever and a thumb wheel that makes it super simple to find your miter angle stop. For the occasional crown trim installer, there is a simple to read crown cutting guide permanently affixed to the table. The bottom base of the saw is 17” deep making among the most stable when we were working with large material. All the stability and size comes at the expense of extra metal making this the heaviest saw in the lineup, weighing in at 57 pounds. We found the saw to be exact out of the box for both miter and bevel angles. The included material clamp is the best that we saw in the group, with it being useful as a crown stop and a material clamp. The clamp also featured a quick adjust system that made is so that it takes less than a full turn to lock the material in place. All in all the Ridgid is a solid performer that comes in at a very fair price. Cons: Loud, No crown bevel detent, Slight miter angle slip when tightening down on the miter lock handle. With the lowest street price, the single-bevel, gear-driven Skilsaw came with some great surprises. Two removable table extension arms are included along with a material clamp. Built into the base of the saw are quick detach miter stand points that work in conjunction with the Skil 3300MS Saw Stand. This stand has adjustable material support arms that extend over 8 feet. The stand folds up to a compact size and weights only 42 pounds (without the saw) and the only draw back being that there are no wheels for easy portability. What we liked is that the total price of the miter saw and stand will still be less expensive than all the other saws in this review. The Skilsaw has the fastest rotating motor in the lineup as well, spinning at nearly 4600 RPM according to our measurements. Speed comes at a cost since it is also the loudest saw in the test. Another surprising feature is the built in laser that we found to be spot on in our cutting tests. If you are a casual wood worker or on a tight budget, this saw is what you are looking for. Thomas Gaige is one of the original founders of Pro Tool Reviews and the Director of Neighborhood Services for Parker Street Ministries, a non-profit organization located in Lakeland, Florida. Tom has nearly twenty years of experience in residential and commercial construction, including owning and operating a residential construction company as a licensed contractor in South Carolina.